Kerry's bubble was just that and the bursting was a Hindenburg. 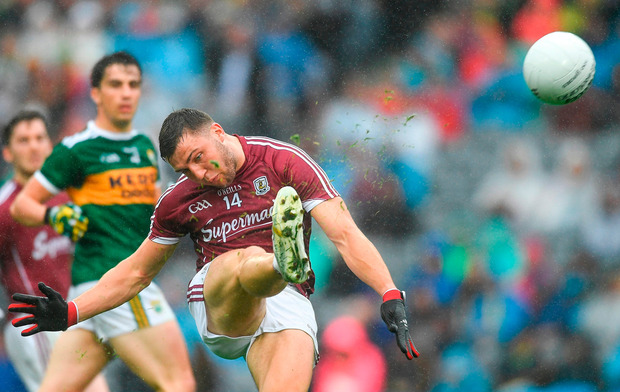 We were outplayed, outfought and out-thought by a rampant Galway. Even the referee was fair but Barry Cassidy is a very slow writer. The game was disjointed with too much scribbling and whistling. Galway attacked with vigour but kicked too many wides to be considered potential All-Ireland winners. But Galway are improving. This time last year Kerry beat Galway by eight points on this very pitch. And how green it is. The rains came at last and the farmers' prayers were answered. Handy forwards wept and the hatchet men sharpened their axes. The hatchet men will be after that decent man Eamonn Fitzmaurice now. Kerry changed their game-plan. There was very little fast ball in and none of the high-pressure turnover tackling we saw in the Munster final. Kerry played like any other team. We had an edge and we gave it away. The late P ó Sé said once you can't win if you don't have the ball. Kerry just let Galway be until they entered our half. The game is all about getting the ball in to your inside men before the sweepers scamper back. I thought Kieran Donaghy should have come on. The boys look up to him and we could have tried a few high ones. Kerry only started to kick the ball in to the Galway goal near the end and were well rewarded. Shane Walsh takes a while to take the frees but he didn't miss one all day. He is one sound man. The loss of Paul Conroy, who went off with a very serious injury, will be felt but Galway still won all the big battles around the middle. The crowd was just over the 20,000. It seems there was a clash with some soccer game. How much did the World Cup clash cost the GAA? A hundred grand? More? You could hear the players shouting on the field and Hill 16 was hungry-looking, like some lonesome place where curlews flourish and you can hear the bittern cry. And I heard the World Cup final was shown on the TVs in the corporate boxes. Bring back the ban. There is hope for Kerry. David Clifford was outstanding. Jason Foley's pace and covering was a huge bonus. We might squeeze through against Monaghan in Clones and more than likely it will be Dublin in the semi if we beat Kildare at home. From the frying pan in to the fire. I have seen all the teams live now and Dublin are still the best. They are not as good as they were last year though. Their high fielding was the finest seen here for some time. Brian Fenton is one of the few players who can catch clean ball from behind his man. Jack McCaffrey caught a ball over his head, while he was falling backwards. There's an opening for an acrobat in the circus, Jack. He is close on the best we have seen in his position. Dublin played at home, on neutral ground. There were harrowing tales of Dublin men having to take two buses to get to the game. The GAA should be ashamed of the fixing of the fixture list. The game was played at 7pm. Most of the Donegal fans I met stayed over in Dublin. By the time the travelling Donegal supporters got back home, it would be at least 1.30am Or much, much later, for those living in the north of the county. The RSA say statistically Saturday night-Sunday morning is one of the worst times for accidents. Donegal were put at risk then and up to ten hours' driving is too much in one day. Curiously enough, Donegal voted yes for the 'Super 8s' and this from a county that would vote no if there was a referendum to give out free television licences. Dublin did get the referee's 50-50 calls. Referee Conor Lane waved play on after signalling a penalty. Niall Scully took at least five steps for his first goal. Dublin played keep-ball and when Donegal did turn them over, the referee penalised Donegal wrongly. Dublin fought hand to hand, but their second goal was a thing of beauty. Dublin in full flight are a joy to behold. There was a new tactic introduced by Kildare and Monaghan. It was camouflage. The two sets of jerseys were at times indistinguishable but endeavour was always on view. Kildare have improved beyond recognition. But if Kildare refused to die , they also refused to kick the ball. Too much passing and too many turnovers cost them dear. Monaghan were also the better at taking their chances. They have some heart and Kerry could be out by tea time next Sunday unless they get stuck in and play our way. Tyrone have been badly wronged. They played lovely football for the most part against Roscommon who put up a big score but hardly got a break from the referee David Gough. Tyrone are contenders. Mickey Harte's men attack in numbers, and every one of them can take a score. Dublin will do well to come out of Omagh with a win, but Dublin don't give in and they should be just about good enough. But the Tyrone full-forward Richie Donnelly is a big find and will trouble Dublin. There was a round of applause before the throw-in for my friend Ray McKenna from Tyrone. All seven McKenna brothers played for the county and Mary, the only girl, was loved by everyone who ever met her. Ray captained Augher to an intermediate county title when we was 17. Ray was a rugby man too and played with Bective Rangers. He did so much good for so many of us, mostly in secret. For that was his way. I am very lonesome after you, McKenna.